Roads in London get worn out. With thousands of buses, cars, taxis, bicycles and people on foot churning up and down day in and day out, and with the city's services running underneath it is no surprise that London's major roads get upgraded - "refreshed" - on a fairly regular basis. (And anyone who rides a bike along Bishopsgate in the City will agree how necessary these upgrades can become!) Road planning theory tends to follow trends; thirty years ago it was for building pedestrian subways and installing guard rails. A few years ago the trend was for ripping those guard rails out again. Nowadays, the big design idea that is currently en vogue is "road narrowing" - especially on major A roads in the city centre - and that's a problem for us cyclists. The thinking goes that by narrowing the carriageway more space is provided for pedestrians, and speeds of motorised traffic are slowed because of the proximity of oncoming traffic. When roads are especially narrow then drivers have to "negotiate" and gingerly interact with one another. Meanwhile, long, wide paved central reservations give pedestrians refuge when crossing the street and encourage "crisscrossability" or casual road crossing. The theory is great, and it is certainly an improvement that road planners are not just thinking about providing for motorcars, but the reality of the subjective experience of cycling on narrowed roads is extremely concerning indeed. If you're a regular cyclist in central London, chances are you will know that cycling on Oxford Street, Piccadilly, or the Strand is an experience to be avoided - especially at peak times. These are all very pedestrian-heavy areas which have been refreshed in recent years with road narrowing schemes. In the first instance, not many people actually feel comfortable "taking the lane". This kind of thinking is a cultural hangover from the influence of vehicular cycling campaigning; the ridiculous idea that bikes should act as motorised traffic and not be afraid to claim their place in the road. Of course the reality is that most people do not enjoy taking the lane (myself included), most drivers do not understand why people on bikes are behaving in such a way, and the subjective experience of having to act like a rolling speed hump is extremely uncomfortable. At the end of the day, when you're just trying to get home safely no one likes having a bus, a truck or an ireful taxi driver revving their engine inches from your rear wheel and with nowhere for them to pass you safely. The hierarchy of provision - the DfT's sliding scale, supported by our national cycling campaign, which suggests what you should do for cyclists - says that the first practical thing that can be done that can help cyclists is to lower the speed of other traffic. Planners and engineers see this suggestion, dream up their road-narrowing, traffic-slowing schemes and tick the "Cyclists" box on their road user charts. Meanwhile, down on the ground, conditions become much worse for those of us on bikes. In the second instance, bicycles are unique in that they are usually slower than moving traffic - which creates the problem as described above - but able to move faster than stationary traffic, which is a key benefit of riding a bike. Being able to sail past rows of cars to get to the head of the lights is one of the key reasons why bikes have such a competitive edge in cities. On a narrowed street there's either no room to filter at all - leaving cyclists sat sucking on the tailpipes of idling buses, or it leaves a very small gap. This small gap leads to two types of cycling behaviour we should not be encouraging by design; it either leads to cyclists hopping on to the pavement and scorching a path past startled pedestrians, or it leads to cyclists squeezing down impossibly tight gaps in a bid to get to the front of the traffic. If the lights ahead change and the traffic jam starts to move, then people on bikes who have chosen to squeeze down the gap find themselves very, very close to heavy moving traffic with no room to escape. This is exactly what happened in Bethnal Green last October when young talented dancer and London cyclist Sofokles Kostoulas was crushed between a parked car, a construction lorry and a road narrowing pedestrian build-out on the eastern end of Bethnal Green Road. Sofokles was taken to the Royal London Hospital but died of his horrific injuries some days later. Next week, on the western end of the Bethnal Green Road, a new road narrowing scheme will open where previously there was room for vehicles to overtake cyclists, via a wide painted median strip. This road is an A road; busy with private motor cars heading to and from outer eastern London and Essex, as well as a key bus and coach route. It's also extremely popular with people on bikes, as well as the "town centre" of the local area with many busy shops, restaurants and bars. In a heavily congested - and heavily contested - space, it seems to be that people on bikes are the ones who are missing out. An existing road narrowing scheme here by Brick Lane has been commercially successful; regenerating a number of businesses and filling empty shops by increasing footfall by pedestrians. It's helped to make the place nicer too, creating space for trees, benches and bike stands. Existing road narrowing on Bethnal Green Road - no room for error. But this is now a horrible place to ride a bike. And this is still an A-road; it is still full of heavy traffic only now there is less room with which to deal with it. Even the most attentive of drivers and cyclists are capable of making a mistake, and I'd like to think the design of our roads have enough slack in them in order to be forgiving of human error, especially when it is human life that is at stake. The extension eastwards of the Bethnal Green Road narrowing scheme, towards Valance Road, will open next week with beautification elements (trees, benches etc) to follow early in the new financial year. A carriageway which was once very wide will no longer be so. Interestingly, the planners and designers here have tried to do right by the bicycle; they're installing some separated cycle paths that run along the inside of parked cars. 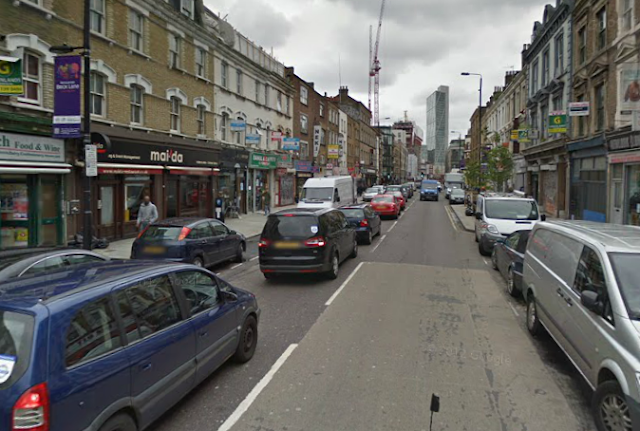 The Bethnal Green Road site as it was until very recently - loads of room for everyone, pedestrians included! But there simply isn't room enough for wider pavements, two separated cycle lanes, two lanes of traffic and two rows of parking. The cycle tracks being built are woefully inadequate; narrow, within the dooring zone of the parked cars, and ridiculously short before they spit you back in to the road from behind some parking. (They were also, in the original plans, quite fantastically weavey, though having inspected the site yesterday it seams the engineers have at least been able to roll them out in a straight line, contrary to the initial designs.) If roads are going to be narrowed by creating cycle tracks then that's fantastic, but as every campaigner will tell you cycle tracks need to be wide, continuous and safe. As it stands the new tracks that have been built on Bethnal Green Road are so narrow they will not be able to accommodate existing levels of cycle traffic, and will only serve to create antagonism between cyclists and drivers when cyclists (rightfully, I think) choose to stick to the main carriageway. This was all pointed out to the lead engineers at Tower Hamlets by the local arm of the London Cycling Campaign. On realising how poor their designs were, the engineers have decided not to paint the new cycle tracks or mark them explicitly as being such. They're describing this as "an experiment". I'm calling it out as an expensive fudge, and a dangerous one at that. The irony here is that before all this money was spent, there was plenty of room here for everyone already - including pedestrians - unlike in some other sites where road narrowing has been used. What exactly was the point? More dangerous conditions for cyclists in return for a few extra trees and some pretty paving? Do we really have our priorities right here, and elsewhere across London where such schemes are prevalent? With such heavy use it is inevitable that roads in London are being refreshed all the time, and whilst our attention is so often diverted by cycle-specific schemes like the Cycle Superhighways, everyday road re-shaping going on across the city could in fact be making things worse for people on bikes. Cyclists and campaigners need to be on their guard, whilst engineers, traffic planners and street-makers need to appraise their work with a more critical eye and avoid just doing what seems to be in fashion and thinking themselves radical for it. The health of London's cycling culture, and the safety of London's cyclists, could be at stake. On major roads with heavy traffic, road narrowing is dangerous and disastrous for cyclists - it is time we moved on from this ridiculous trend. For more analysis of the problem with road narrowing, looking especially at what used to be the busiest road for cyclists in the City of London (Cheapside) do read this excellent post from Cyclists in the City published over the weekend. lets hope someone's listening. Recent mayoral pronouncements suggest they are. @Discoaddict I hope so, and the Mayor's recent announcements are indeed welcome. My concern is that much of this work is being done by local boroughs independently of the Mayor, and their work doesn't get as much attention as the big ticket cycling projects. Indeed, because road narrowing is effectively just the re-making up of existing road surfaces it doesn't even need planning permission - we are lucky if Councils consult on it at all. Subsequently, I have a very genuine concern that great swathes of London's cycling landscape is being made more dangerous and unpleasant for people on bikes by stealth. I've seen the new 'cycle lanes' - they're very narrow and run at pavement level beside the parked cars. This astonishes me because if they're not going to be marked as cycle paths then they're NOT cycle paths, they're pavement and cyclists can get fined for cycling on them, or at least get shouted at by pedestrians. Also if a cyclist gets doored by one of the parked cars they won't have any legal right to complain - as the driver can say why should they have anticipated a cyclist on the pavement. Another example of Tower Hamlets council planning the cycle out of their borough. Thanks for stopping by and taking the time to comment. I have to cycle here too as it is part of my ride to work and I must confess I am most unhappy about the situation. As for the "experiment" it will be interesting to see how Tower Hamlets do this in terms of marking the bike tracks. As you rightly point out there are definitely liability issues here on top of the fact that the design is dangerous. Interesting how there is segregation keeping the motor traffic schemes apart (paved central reservations, hatchings) but not for separating cyclists from the vehicles. Just to let you know that similar plans are afoot here in Oslo - road narrowing, called "cycle priority". I call it infrastructure removal. Putting a cycle lane on the inside of parked cars has its problems, but isn't it better than putting it between parking bays and the traffic as is often done? I agree, inside bike lanes are better than offside bike lanes. But they need to be more than 0.9m wide and longer than just a few metres, otherwise there is more danger to the cyclists as they leave, join, leave and rejoin the carriageway (sometimes obscured by the parked cars) In a nutshell, they're great but have to be done really well. I see the good points and the bad ones of road narrowing. Can we hope that drivers would just stop using these roads b/c they are too narrow? They already have to slow down considerably, so maybe that might put them off..
@Anonymous. I agree that road narrowing on minor streets and back roads could help to discourage motorised users. Coupled with filtered permeability and through road closures they can help to funnel motorised traffic on to primary routes and effectively create an alternative network for cyclists. However, the cases here (Oxford St, the Strand, Bethnal Green Road) are on primary A roads; essential routes for keeping the city moving and home to a number of key bus and coach routes. Essentially, there is nowhere else for the traffic to go. If traffic is going to evaporate because of inconvenience, it is going to be bicycle traffic that goes first. Wishful thinking isn't going to be enough, I'm afraid. I do get the impression that these schemes have been designed by architects, without much reference to engineers or to anyone with expertise in modelling traffic flows. Certainly the schemes at Cheapside and at KensingtonHigh St were designed by a firm which styled itself as architects. 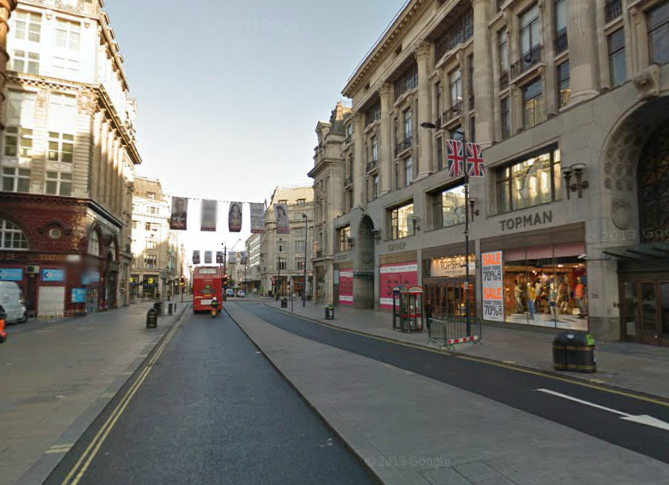 They liked the idea of wide pavements - and there is something in that as both areas have become major retail venues - and they apparently also liked the idea of using cyclists to calm traffic for the benfit of pedestrians. It rather remins me of my old granny, Sheffield born and bred, who was moved out of her back-to-back in the early 60s, to a new area of the city scattered with "deck access" maisonettes and tower blocks. It very quickly became apparent that the tenants hated them. One of the fundamental problems was that you coun't just pop out of your front door, walk along the street, and knock at a neighbours for a natter. The architects dreamed up a scheme which seemed almost elysian - to their own very specific tastes, from their middle class suburban backgrounds - but which in reality was a mightmare for the people who had to use it. We have seen that writ large of course with large estates such as Broadwater Farm where the design just creates a wasteland of ambush points for drug dealers etc, out of things which no doubt, to the architect, seemed jolly nice. Question is, if the TRL did astudy on this some years ago, and if I can lay my hands on a copy - why, oh why, do these firms not do the same, and see for themselves? Sometimes I wonder if cycling in London is even moving forwards at all - after all this time it's transparent that most of the people designing the loads don't get it. All we have are nice words from the mayor, I believe we also had nice words from the previous one. thanks for increasing awareness. I'm very unhappy at being a rolling speed bump - it's not comfortable. Islington council have just narrowed part of Hornsey Road near Arsenal Stadium by building out street corners and creating additional parking space. What was the 'safe' alternative to Holloway road suddenly seems far more precarious. The additional parking seems to have created demand (there seem to be far more parked cars than ever before) while the narrowed road means cars are more likely to back up in queues to the lights. Queues we can't sail past because of the parked cars and pinch point street corners. I don't know a huge amount about the road planning process. Is it normal to consult with road users or is it more likely this was another well-meant attempt to calm the roads? Concerned about Southwark council's plans for Camberwell too. True, TfL will make sure they get the lanes they want for the upcoming Cycle Superhighway, but if the rest of the scheme is to be anything like Walworth Road is now, it'll be horrid. The same road narrowings with pedestrian refuges are popping up all over Rushmoor in NE Hants. They are at worst when they come in multiples along a road. The advice given is it take the road. I was beeped at for doing this today. Sad to say I braked and deferred just before the bottleneck. Regarding anonimous's comment "I see the good points and the bad ones of road narrowing. Can we hope that drivers would just stop using these roads b/c they are too narrow? They already have to slow down considerably, so maybe that might put them off.."
This is what happens in this area already thanks to the convenient rat runs provided by the borough. Bethnal Green rd can sometimes be really quiet when the small streets alongside it are mini cab racing tracks. The tracks are being built because money needed to be spent and this was on the shelf ready to go. One email to the local LCC group would have provided a list of areas where to spend the money much better, for example to enable cyclists to use the surrounding streets and choose much better router than Bethnal Green road. I use this bit every day and still fail to see which problem this cycle track is actually trying to address. Why is there parking along a fast busy A-road such as this one? This road does not need parking along it. The problem is that this road is NOT WIDE enough as it is for all the traffic that wants to travel along it. The simple solution is to remove all the parking and replace it with a cycle lane. At the moment people on bikes have to take the lane as otherwise they're cycling right in the door kill zone. But when we take the lane cars can't get past as the road is too narrow, so they get annoyed and aggressive and react dangerously. Along Bethnal Green Road I have had taxi drivers try to kill me by swerving into me, honk, tailgate, zoom past with millimeters to spare, shout, swear, threaten and generally intimidate me because I am 'in the way' and preventing them from accelerating to the next set of red lights. The pedestrian islands are at junctions just after red lights, so cars will crowd into the Advanced Cycle Box next to you so they can zoom ahead and swerve into your path to get past the ped island before you. The whole road is a disgrace and encourages dangerous and antisocial behaviour from both drivers and cyclists. It's a very important issue, as for many people it is the only viable route into town and back home - and the terrible design of of the road is putting our lives and those of our loved ones at real risk. But what can we do about it? Perhaps we need some reclaim the streets style protests to close off the road a day a month until Tower Hamlets Council take us seriously? the other problem here is excessive parking provision - there just isn't space on these main roads for motor vehicles, bikes, pedestrians, and a bunch of stopped cars taking up space on the street. bike parking, sure. loading bays where necessary, but that's it. this is the inner city. there's great public transport. parking bays are not necessary. I cycle to work along East Lane in Brent, a major feeder road going towards Wembley Stadium, and this exemplifies most of the points about road narrowing. Most days I resort to riding the median strip (marked with diagonal lines) as there is no room to filter past stationery traffic on the inside. There is ample room for cycle lanes much of the way along the wide pavement, where there are long stretches of grass verge. But I don't have any hope that will be implemented, as the council would rather spend their paltry cycling allowance on cycle training schemes. This is happening at a rapid rate, and I assume is part of TfL's latest insanity bout. Major junctions at the Strand/ Waterloo Bridge junction and the Bullring roundabout, for example, have seen massive road-narrowing (and absurdly wide pavements). It's creating deadly crush-zones for cyclists. You're ignoring the reason why this "ridiculous" trend is being implemented...Yes, it is indeed true that there should be more space for cyclists on these roads, preferably with some sort of a physical barrier separating the space where cars drive and where cyclists do, but you are clearly not understanding how much slower the drivers must go when the roads are more narrow...It's not a difficult concept to grasp. As I cycle and use a bus on this section of road on a regular basis I think I understand the concept of this road design perfectly. Of course drivers *should* go more slowly when roads are narrow, but more often than not if they are moving they are still moving more quickly than cyclists, which leads to close and dangerous passing. If traffic is stationary then it leads to people either cycling on the carriageway or squeezing in to very dangerous gaps, as described above. So who wins? Not drivers. Certainly not cyclists. Why, when I am on my bike, should I either be used as a rolling road block, or disadvantaged by being made to wait with all the other traffic? Clearly there's more to the issues behind the concept than you make out - it is certainly not a black and white issue which is why I wrote; "engineers, traffic planners and street-makers need to appraise their work with a more critical eye and avoid just doing what seems to be in fashion and thinking themselves radical for it." Absolutely... cars don't want to be forced to go slower by a bicycle in the way -- and they will do whatever they can to get past, or to get that bicycle out of the way. And that's dangerous. And that's been proven by the current design in the middle and at the Bethnal Green end of Bethnal Green Road. I understand, people get caught up in the importance of what they're doing. They're focussed, they're not thinking through all the consequences because they have enough on their plate. Driving is a complex skill, and uses a lot of the brain's processing power. Which is why it is important that we don't entirely put it upon drivers to look out for the safety of other road users - we have to design the road in such a way that it protects everyone and forces everyone to treat each other with space and respect and care. An excellent way of encouraging pavement cycling. If we're allowed to cycle on THAT pavement, then how do we know which pavements we're not allowed to cycle on? Roads should be suitable for everyone to ride on, including a 70 year old granny going to the shops, and a 13 year old girl returning home from school. I watch this discussion from the states with some interest, as similar discussions are happening here. How wide is the "experimental" cycle track Bethnal Green Road? Clearly, the original wide road lane is preferable to the author than a poorly implemented cycle track, but I'm curious what a "wide enough" cycle track would be? In the states, 2.43 m is considered the absolute minimum for a one-way cycle track adjacent to parking, and 2.74 is the preferred minimum. Are these dimensions too narrow still? @Nick Hi and thanks for your comment. The experimental cycle track on Bethnal Green Road varies in width between 0.5 metres and 0.9metres. Most design standards state that cycle tracks should be a minimum of 2 metres each way (which I support) so as you can see these aren't nearly big enough. 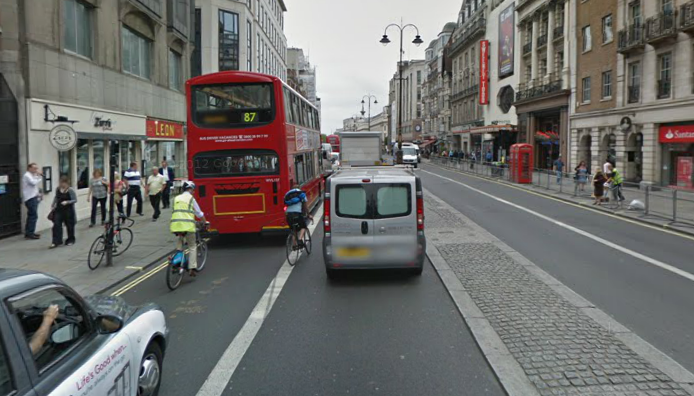 They also are very short and dump cyclists back in to the traffic from offside which could cause visability problems. Broadly speaking I welcome the intention of what the traffic engineers are trying to do here, my problem is with their style of delivery. Thanks for the measurements. Please tell me there is some sort of separation between the "cycle track" and the parked cars that is not included in your dimensions. I agree that 2 metres for the track is a good minimum, as long as there is enough separation to remove door zone risks. @Nick Nope, that's it. .9 metres, butted up against the doors of the parked cars. In fairness, there are many on-carriageway cycle paths in London which are about ten years old now which are just as bad, but the point of course is that we shouldn't still be building this sort of thing. At the end of 2012, THW was consulted by LB Tower Hamlets on a scheme for the western end of Bethnal Green (between St Matthew's Row and Shacklewell Street). It involves the road being narrowed and cycle tracks built either side of the road in between the parking bays and pavement. We responded objecting to the proposed plans for numerous reasons e.g. lack of reasoning for the need to take cyclists off the road for this short section, creating new dangers at the track entry and exit points, convoluted route of the cycle tracks (winding around trees...). Overall we consider it a waste of money. At the beginning of March, THW reps met with LBTH officers on site at Bethnal Green Road to discuss our concerns further. The construction work though had already begun and we're left still being unclear why the council wants to build this facility and narrow the road. The road narrowing part of the scheme is the same as was recently implemented at the western end of Roman Road. We weren't consulted on that work but again since using it are unclear of who it is meant to be benefiting. Looking forward we welcome that we are being invited earlier on in the process for intended works at the eastern end of Bethnal Green Road. We will continue to hope we can influence the traffic planning so that schemes properly consider pedestrians and cyclists. I'm really glad you wrote this post, I completely agree with you. Now they are proposing to remove a one way system in a residential area and narrow the roads, when there is an obvious opportunity to use the space for generous cycle contraflow lanes and wider pavements where needed. Sadly Southwark Cyclists gave the scheme their full support. Have you also seen on the west to east cycle lane, they haven’t even moved the Pay and Display meter from the ‘cycle path’? I’ll try and get a photo if you are interested. It leaves circa 40cm for a bike to squeeze by. It’s ridiculous. I live at the east end of Bethnal Green Road (near the underground station), but gave up cycling along it after seeing a few nasty scrapes / accidents with all the pinch points and parked cars. I now turn left to ride down Wilmot Street, and turn right to ride along Three Colts Lane, Cheshire Street, and Sclatler street on my way to and from work. These roads run parallel with Bethnal Green Road. The only issue with this is that it involves a slightly longer route simply to avoid one way stretches and ‘no entries’ (Sclatler street going in to the city, and Cheshire street on my way home both have very short stretches of one way, and no entry signs, meaning you have to use Bacon Street). I’ve always thought a far more adequate way of getting cyclists one end to the other of Bethnal Green Road would be to make these one way stretches of road 2 way for cyclists, and then diverting the cycles off Bethnal Green Road to these quieter streets, and clearly marking areas of the road for cyclists (not segregation, just markings). The cost of that would be a few signs and some street markings. The expense to a cyclist is then maybe up to 1 minute additional riding, but in a far safer environment. Good blog above, agree I like the sentiment of putting in cycle lanes, but this are just ridiculous – and the fact that they are not marking them does expose the liability issues you outline too. Crazy.